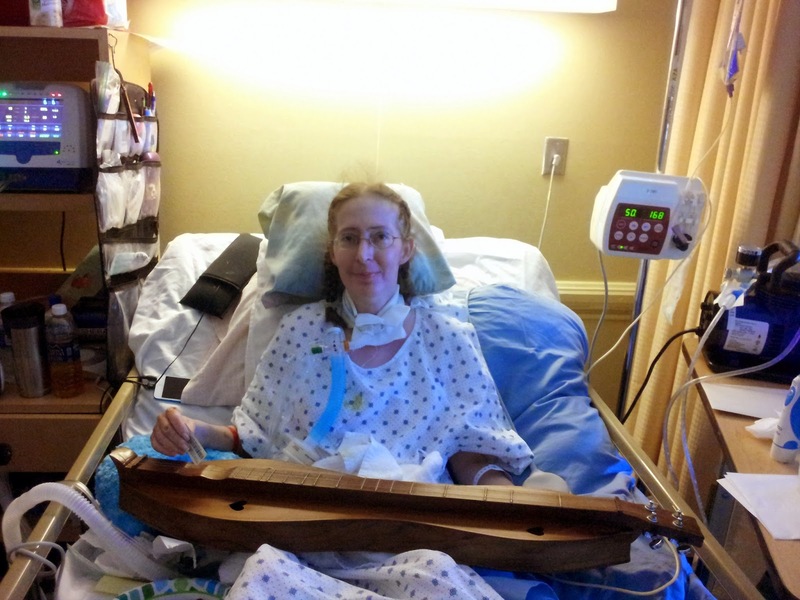 Keith told me that he bought my Dorsey Williams dulcimer, which was his anniversary gift for me, while I was still in the coma. Seeing as he's also a dulcimer player, he would've bought himself a very fine dulcimer if I had died or never recovered enough to play it, as my doctors expected. But of course I did recover, and it's one of my favorite dulcimers now. Before our vacation in Sicily, I hadn't been able to play as much as I used to before I developed dermatomyositis. The DM damaged my proximal muscles, including the muscles of my shoulders and arms. I could only lift my arms for about a minute before they would drop like a stone. I eventually stopped playing to rest my arms because I thought my problems were due to shoulder strain from using my laptop too long without adequate arm support. I had already quit practicing fingerpicking because the cracked and bleeding skin at the tips of my rash-covered fingers made it impossible. I hadn't yet connected the two seemingly unrelated symptoms. Once my DM was correctly diagnosed, and the prednisone started to work, I was able to start playing the replica scheitholt--a German dulcimer ancestor--Keith gave me for my birthday. 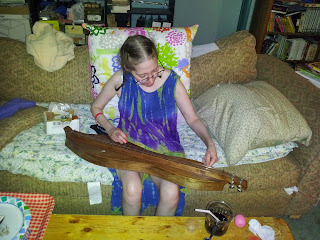 It was hard for me to tune because it had zither pins instead of tuning pegs, like a regular dulcimer. Keith dug up a ratchet to help me tune the pins because a regular tuning wrench wouldn't work with the non-standard size zither pins. The tuning remained difficult for my still-weak hands, however, and I had to use every ounce of strength I could muster. I had a lot of fun playing Greensleeves on the sheitholt, though. It seemed like an appropriate song to play on a replica of a 17th century instrument. And the challenge of learning a new song encouraged me to stick with it, playing for ever longer periods as my hands and arms slowly strengthened. The continuing raw state of my fingers and knuckles still prevented me from fingerpicking. But before long, I started preparing for our trip to Sicily, and my playing time began to wane. When we returned, I was too sick to play. We all know what happened after that. When Keith brought the Dorsey Williams dulcimer to the nursing home after my awakening, it was just to show it to me. I was too weak to actually play it. And when went I went home on a furlough several months later in preparation for returned permanently, I wasn't able to play it much because I had limited time on the furlough. I was still weak, as well, and my playing had become rusty. 6-week comas can do that to you. A couple of weeks later, I left the nursing home with sheets of physical therapy exercises for my arms and shoulders. But the one I was most eager to pursue wasn't on the printouts.